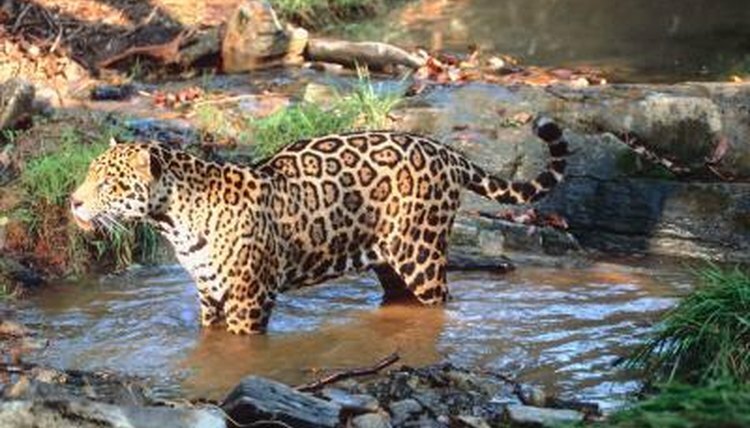 Jaguars are the largest cats in South America. Between their size, their powerful bites, and their impressive climbing and swimming abilities, jaguars are particularly well-suited for hunting. Because they primarily stay in densely wooded areas near bodies of water, the Amazon basin has a notably high concentration of these creatures, who find their prey in the river and in the surrounding jungle. In the waters of the Amazon, jaguars feast on turtles and fish. They may prey on caimans, smallish members of the alligator family who can reach lengths of 6 feet. Within the jungle, jaguars eat birds and monkeys; they may even stealthily climb trees for ambush. In the grasses outside the jungle, they may hunt four-legged prey like peccaries, tapirs and deer. Generally, jaguars are not picky eaters, but they prefer to stalk their prey from the ground before closing in and attacking with their powerful jaws.